Madagascar is an animated series of films from DreamWorks Animation. The first was released in 2005, the second in 2008 and a third is scheduled for 2012. The films feature the voices of Ben Stiller, Jada Pinkett Smith, Chris Rock and David Schwimmer. The main characters of Madagascar are Alex the lion; his best friend Marty, the zebra; Melmen the giraffe and Gloria the hippo. The first film follows the foursome's exploits as they follow the penguins and escape the Central Park Zoo. When the animals are tranquilized and sent by ship to Kenya, the penguins escape and get them shipwrecked in Madagascar. 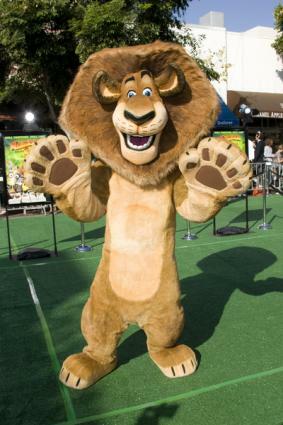 The story focuses on Alex the lion as the main protagonist of the film. Voiced by Ben Stiller, Alex is spoiled by his life of comfort at the zoo, but longs for adventure. Marty the zebra is his best friend and while they are all initially excited about freedom, Alex undergoes a crisis of conscience when hunger drives him to see Marty as a piece of steak. In the second film, Alex's origins at a nature preserve are explored when he is reunited with his parents. Alex's best friend is the zebra named Marty, voiced by Chris Rock. Marty's optimism keeps Alex going even in the face of Alex's threat to Marty personally. It is Marty's boredom that provides the impetus for the animals to explore life outside the zoo. Despite initial panic over the shipwreck, Marty's bright spirits bring the group back together. When Alex goes 'savage' for a time, it's Marty who brings him back from the brink. In the second film, Marty is discouraged by meeting other zebras that share a herd mentality and no uniqueness. He rejoins his friends as they are his 'herd'. The giraffe, Melman, is voiced by David Schwimmer of Friends fame. The neurotic giraffe suffers from hypchondria and frequently sees the zoo's veterinarians. Melman is also deeply devoted to Gloria, the hippo. Melman rushes to tell Alex about Marty's initial escape from the zoo and tags along when Alex and Gloria pursue him. In the second film, when the watering hole dries up, Melman offers to sacrifice himself for the rest of the animals, but thanks to Alex, that proves unnecessary. Melman's awkwardness is endearing and his friends clearly love him, flaws and all. Gloria is the hippo, voiced by Jada Pinkett Smith. More mature than the boys, it's often up to Gloria to get them back in line. Gloria is the one who insists that Alex and Melman help her find Marty when he escapes the zoo in the first film. She keeps the boys firmly planted when they would otherwise go crazy. In the second film, Gloria longs for a boyfriend and discovers a male hippo named Moto. It takes her time, but she realizes that Moto is only interested in her plump form whereas Melman just loves her for her. The two are united and they work to save Alex together. Many other characters contribute to the journey of Alex, Marty, Gloria and Melman including a lemur, a fossa, penguins and more. Maurice and Mort - Voiced by Cedric the Entertainer and Andy Richter respectively, the Aye-Aye and Mouse Lemur are Julien's lackeys and advisors. Skipper - Voiced by Tom McGrath, Skipper is the ringleader of the penguins and develops all their plans for escape. It's he who leads the takeover of the ship prior to the shipwreck, suggests Alex eat sushi when he is starving and helps design the aircraft to return the animals to New York. Kowalski - Voiced by Chris Miller, Kowalski is Skipper's lieutenant and helps him make plans, taking over for him when Skipper is absent. Private - Voiced by Christopher Knights, Private is the youngest and the shortest, and follows Skipper and Kowalski's orders. Rico - Voiced by John DiMaggio, Rico doesn't talk much, but he is fond of explosives and does a lot of Skipper's dirty work. Mason and Phil - These Central Park Zoo's chimpanzees are voiced by Conrad Vernon (Mason only) while Phil communicates in American Sign Language. Zuba - Voiced by the late Bernie Mac, Zuba is the alpha lion of his pride and Alex's father. Florrie - Voiced by Sherrie Shepherd, Florrie is Zuba's mate and Alex's mother. Moto Moto - Voiced by will.i.am, Moto Moto is Gloria's would be boyfriend in the second film. Nana - Voiced by Elisa Gabrielli, Nana is Alex's human nemesis. The Fossa - Voiced by Eric Darnell and Tom McGrath, the creatures are terrorizing the lemurs in the first film. Makunga - Voiced by Alec Baldwin, Makunga is Zuba's greatest rival and sets out to destroy Zuba, Florrie and Alex. The popularity of Madagascar's characters expanded beyond the feature films to include short films, television series and video games. Madagascar's short films include The Madagascar Penguins in a Christmas Caper and Merry Madgascar as well as the Nickelodeon series The Penguins of Madagascar. The short films and television series focus on the penguins as central characters, although Alex, Gloria, Melman and Marty appear as stuffed animals and souveniers.